Player - Tomas Plekanec. This base card is number 123 from the Base set from 2015-16 O-Pee-Chee Platinum Hockey. Player: Tomas Plekanec. Team - Montreal Canadiens. Team: Montreal Canadiens. Card Number - 123. This is a rare 2018-19 O-Pee-Chee Tomas PlekanecSilver Border parallel series card. It has always been very carefully handled. THIS CARD IS IN NEAR MINT TO MINT CONDITION. Player: Tomas Plekanec. Team: Montreal Canadiens. Breaking cases of every new set across all major sports as well as many non-sport and even more obscure releases. Sport - Hockey. NHL Hockey Cards. 2015-16 Upper Deck NHL Cards. 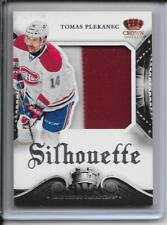 You're looking at a very cool Tomas Plekanec 03/04 Upper Deck Premier Collection Super Rookies /399. Very nice card for any collection. Rockets Sports Cards. 5% GST for remaining residents of Canada. Player: Tomas Plekanec. Team: Montreal Canadians. Autographed: false. Manufacturer: Upper Deck. Year/Season: 2013-14. Autograph Authentication: UpperDeck. Sport: Hockey. This card is in NM/Mint condition. see other items and combine shipping 2.95 shipping for as many single cards as you want. © 2Bros Sports Collectibles, LLC.